This 1920×1080 dynamic Ultra Slideshow is a showcase of some of PS4’s AAA titles. 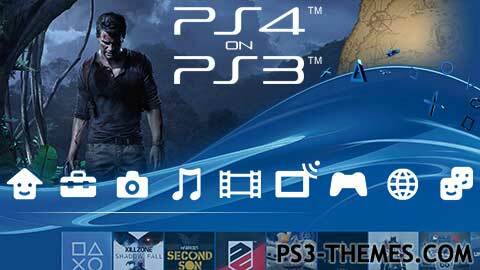 The theme itself is made to simulate the PS4 user interface with sounds extracted from akaBATOUSAI’s “PS4 XMB 2.0” theme. Enjoy. Changed Bloodborne wallpaper to resemble cover art. Added a couple more dynamics and minor timing changes. Changed a couple of icons. Remade all sounds. Changed system_ok sound. This theme was posted by PS3 Themes on April 23, 2015 at 11:28 am, and is filed under Gaming, Slideshow Themes.You can leave a response or trackback from your own site. @DanSta – Thank you. I created the render from a few PlayStation branding images. That’s Nice….where do u have the Render from the Background? good work. I like it, thanks. A few small tweaks. Nothing major. Its very nice, i’m going to download it! I was gonna do a 3rd party version. Some of those games will be there. I wanted to put Until Dawn in this theme, but I didn’t like the official pics. No remasters. @ThugKnight – Sure I can do that for you. uLtRaMa6nEt1c you can make a theme with the xbox one interface? This Theme Is Amazing. You Are A Talented Genius. Best PS3 Theme I Have Ever Seen! FANTASTIC!!!! I love the way you put this together:) It Looks GREAT and has good funcsionality. @Rafael_bernardo11 – I’m not taking requests. I just did this to refresh myself with the process, and to unify my PS4 ans PS3 experience. @Raphael_bernardo11 & K_R_17 – Thanks guys 😀 I might do some other versions too.